News item: The Ohio Legislature is considering a bill to facilitate oil and gas drilling on state lands. Nothing new here. This has been a perennial issue in Ohio and other states. Legislators, whose campaigns are bankrolled by oil and gas interests, love to trot this out when the stars align favorably. In other words, when the economy is tanking and energy prices are surging. This is kind of like those remote backwater countries you read about where people become so destitute they have to sell their own children to survive. Except, in this case, the legislators want to sell your children. Until now, cooler heads have prevailed when this issue has come up. Legislators beholden to gas and oil interests haven’t had the votes to push it through. After all, it’s kind of a tough sell when there are still a few conscientious legislators in the room whose idea of a day at the beach doesn’t involve frolicking along the shores of a festering gas well wastewater pit. What’s different this time around is the ominous threat of bringing wholesale hydraulic fracturing to Ohio’s state forests and parks. In spite of what industry shills — including politicians and their bureaucrats on the county level — are telling us, this is dirty, noisy and dangerous business. Besides, it’s not nearly as lucrative for lessors as they would have you believe. Well, that’s a lie. Just ask our neighbors in Pennsylvania. They have plenty of evidence to suggest otherwise, much of it too well-documented to dismiss as anecdotal or coincidental. The truth is, this is not your daddy’s hydraulic fracturing. Today’s version is recently developed technology using higher pressure, horizontal boring covering great distances, consuming millions of gallons of water and spewing tons of hazardous substances into the air, land and water. So far, Ohio media seem to have turned a blind eye to this. Few I’ve seen have questioned the drilling proponents’ “safe-as-milk” spiel. But then, Pennsylvania is a world away. And, in our neck of the woods, word travels slowly. Here in Mohican Country, we’re getting ready to celebrate the 50th anniversary of our canoe livery industry. Like every other summer, people will flock here to enjoy the river, the scenery and our 5,000-acre Mohican Memorial State Forest. If the gas and oil industry — and the politicians they own — get their way, we’ll have a lot more to offer vacationers in the future. 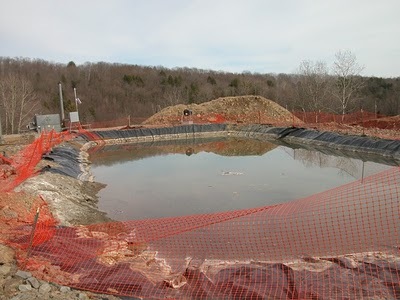 Our forest, parks and countryside will be dotted with toxic wastewater lagoons, drilling pads covering 5-10 acres and turbines the size of Winnebagos. (The turbines are used for pressurizing gas lines.) Our roads will be choked with convoys of tractor-trailers servicing well-drilling and waste-removal operations. With all that noise and commotion going on 24/7, city dwellers visiting Mohican Country will feel right at home. And, because it takes millions of gallons of water to open up each well, the rivers and lakes around here will be so shallow that tourists won’t have to worry about their kids drowning. Not even if they stand on their heads. Of course, we’ll need a catchy slogan consistent with our new image. How about: Mohican Country — Frack to Nature!